This trip has been a bit atypical for us. Usually independent travelers, we are doing things differently this time around. We are caravanning with our amigos Ruben and Robbie, who have plans to build a palapa-style house on the beach this season. Both of our rigs are fully loaded with tools and building materials, along with the requisite toys. This brings me back to the inspiration for this post, TRUCKS! We travel in a 1999 Chevy Suburban with a 454 engine. Ruben and Robbie are rolling down the picturesque M-1 in a 1993 Dodge Ram Cummins diesel. 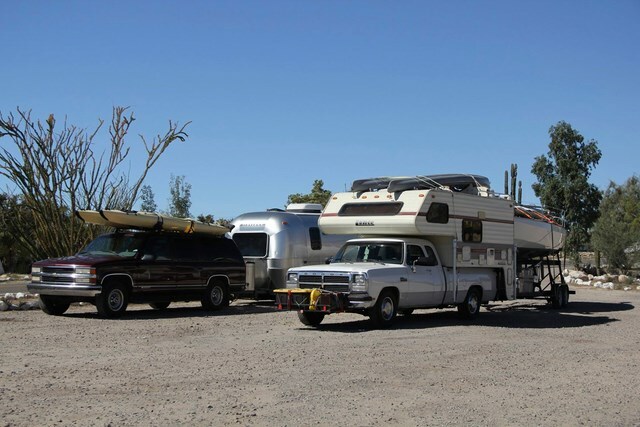 Our tee vees (tow vehicles in the RV world) are workhorses. We travel slow and steady over the rolling hills of the peninsula. The ribbon of highway takes us through the beautiful and orderly Ruta del Vino (wine route) and then along the Pacific coast. We travel through small Mexican villages where something from our caravan inevitably catches an eye. It might be “Hoss,” the handsome Dodge. It might be “Bambi,” the shiny Airstream. 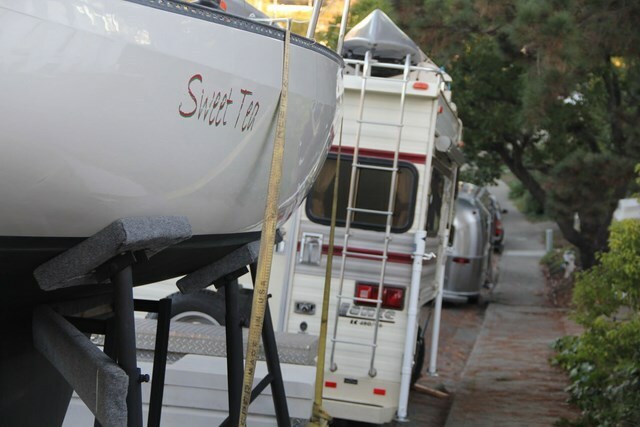 It might be “Sweet Tea,” the loaded-down sailboat. Or oftentimes a small child or a hip teenager will spy Ringo’s fuzzy face smiling back at them. Yes, we are turning heads. 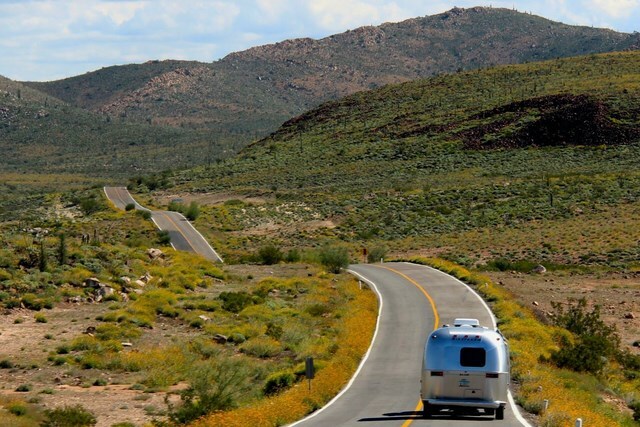 Every stop requires a conversation about sailing, or a tour of the Airstream. As Tim and I watch the road, we are in awe of the splendor that a wet summer has created. The cirios can’t possibly support another leaf, and brilliant yellow wildflowers line the highway like piping on a fancy cake. The short drive between El Pabellon and El Rosario reminded us more of a drive in Ireland than one in Mexico. 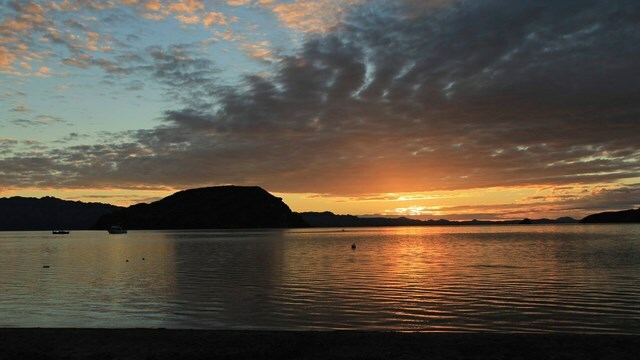 Greetings from beautiful Baja California Sur! Our regular blog readers and friend are very familiar with our amazing Slab City encounter a few years ago. Since that chance meeting in the Brawley Wal-Mart parking lot in March 2012, we have visited the “Slabs” a few more times, most recently to pay our respects to Mike Bright’s widow, Lynn. We learned last April that Mike lost his battle with tongue cancer much the same way Tim’s fabulous sister, Stacy (and most all others who receive that horrible diagnosis) lost hers. Our next adventure takes us to a new and different kind of “Slab City.” We are embarking on a journey that involves a couple concrete slabs, some newfound friends, and an intention to build a long time dream. Tim and I have spent many a Saturday morning talking/dreaming about building an off-grid home where the sun shines readily and we can live simply. We explored Costa Rica and the Big Island of Hawaii, and thought about Bali and the Caribbean. What we didn’t think about was the obvious -- our favorite beach in Mexico, Playa el Coyote. 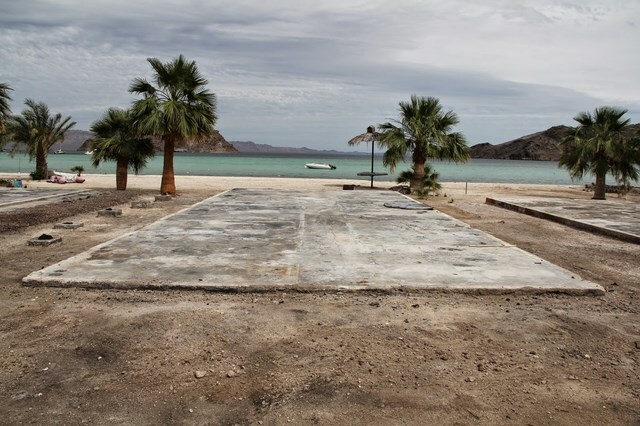 Earlier this year we had the opportunity to procure a lease on a beachfront property on the north end of Playa Coyote. We uncharacteristically leapt without looking back. Fire destroyed the previous home and two others. Nothing but concrete slabs remain, hence Slab City – Parte Dos. Our friends Robbie and Ruben jumped on one of the lots first, and told us about the others. We ended up right next-door. We have decided to work together to build two homes in the same palapa style. Tim meticulously designed the homes down to the number of nails needed for each. If you know Tim, this won’t shock you a bit. Before traversing the trans-peninsular highway down the spine of the Baja, we spent a few weeks in Vallejo, CA at Ruben and Robbie’s home planning our joint project. There we decided to adopt the Asset Based Community Development (ABCD) model. Instead of bringing two of everything, we’ll each bring enough to share. This is a model I have helped neighborhoods to adopt during my career working with non-profits, and it seems to work beautifully in this situation, too. The assets we share are tangible and intangible. The material things, along with the skills, knowledge and passions the four of us bring are diverse enough that we all bring something very important to the table. I hope to share a few anecdotes about this project through this blog. We have no idea how soon we will be given permission to begin building, as there are a few layers of permits to get through. In the meantime, our camps are set up behind our slabs. In addition to our camping rigs, we each have a screen tent, running water, solar power, and a septic tank (all operating flawlessly after some blood, sweat and tears.) We have also gotten a trash system going with a big emphasis on composting, reusing and minimizing the amount of waste we produce. Ruben have started buying their beer in returnable glass bottles. There is also far less packaging used in Mexican products than those sold in the US, so we are hopeful that we can make a significant reduction in our waste. Beyond our partners in building, our other beach neighbors have been beyond welcoming. We received a wonderful dinner and decompression support (after five days of really hard driving) upon arrival by our neighbors KG and Swanee, followed by a full-moon party a couple days later. On Saturday night we danced to Fast Eddie and the SlowLearners for hours at the Estrella del Mar restaurant/bar right across the road from our gate. So far we have spent our days working and playing, intent on striking the perfect balance as we embark on this project. Jack-hammers, picks, shovels, plumbing parts, rakes, brooms and hammers intermingle with kayaks, stand up paddleboards, swim goggles, and a variety of floating toys. The bay is like bath water this time of year, and we aim to get in a few fun activities each day.